It’s now been two weeks since pro wrestling lost one of its favorite performers. The outpouring of emotion and personal sentiment for Eddie Guerrero from friends, fans and colleagues has been overwhelming to say the least. Eddie was the complete package in many ways. He had the pedigree, the skill and, most of all, the love and the passion for the business that the greats of the game always seem to possess. But Eddie may have been guilty of loving the business too much. I’m sure many diehard fans and even some in the business will scoff at that remark and its implication, but it’s true. One of the things Eddie truly loved and lived for, wrestling, may have been what killed him. Eddie was only 38 years old when he left this world. That’s too young by anyone’s standards. But it happens over and over and over in the business of professional wrestling. I certainly don’t want to diminish the touching tribute shows WWE presented in honor of Eddie, along with the heart-wrenching expressions of love from many of his friends in the company. I just wonder when someone will step up to the plate and take notice that too many of wrestling’s offspring are dying long before their autumn years. Some call it a culture of death. Roddy Piper labels it “The Sickness.” But until this problem is dealt with, wrestlers will continue to drop dead in motel rooms, families will be left behind, friends will mourn and wrestling companies will toll the bell 10 times. 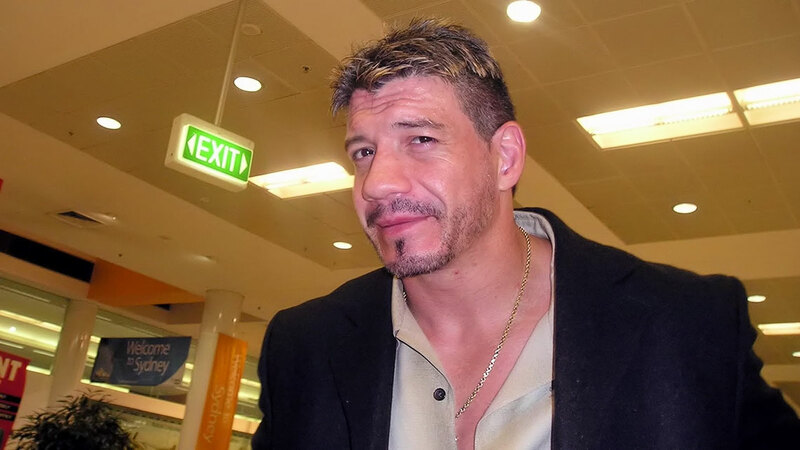 Like many others had before him and many others undoubtedly will after him, Eddie Guerrero considered professional wrestling the be-all and end-all. Only four months out of his life did he ever consider anything but wrestling as a livelihood, and even then it wasn’t all that serious. And, like many of his colleagues in the business, Eddie had an addictive personality. Whatever he did, he went all out. And that included an affinity for drugs and alcohol. The autopsy attributed Eddie’s death to heart failure. His wife, Vickie, said that his enlarged heart showed signs of damage. Blood vessels had been worn from years of abuse . “It was from his past – the drinking and drug abuse,” she stated. By all accounts he had been sober for four years. But the damage had already been done, and the grueling ring schedule only served to speed up the process. It may take weeks before the official cause of his death is determined. Toxicology tests will be conducted, and blood will be sampled. Eddie left behind a wife and three daughters. Just weeks earlier he had moved his family from central Florida to Phoenix, Ariz., into a new home where bags and boxes still lie unpacked. Like Martha Hart a few years earlier, another wrestling widow will unpack in a brand new home, and will raise children without their father. I had a nagging, uneasy feeling in the early Sunday morning hours of Nov. 13. Not one prone to premonition, I thought about Eddie Guerrero and went through a couple of my old interviews with him. Like a number of his co-workers, I had expressed concern about Eddie over the past year. His short-lived title run in early 2004 had placed a heavy burden on his shoulders, and some feared he might be cracking under the pressure. Eddie was a perfectionist, and he always wanted to have the best match on the card. On the rare occasion he didn’t, he would spiral into an emotional abyss, fretting over a botched move or a missed spot. But that was just Eddie. Fitting the image that the company places a premium on, Eddie had bulked up considerably over the past couple of years in WWE, looking nothing like his cruiserweight version in WCW or his even lighter days in Mexico. It wasn’t a secret that he was carrying far too much muscle mass for his 5-7 frame. He constantly worked in pain and pushed himself beyond his physical limits, but he rarely complained. A lot of the pain, of course, stemmed from a serious car accident seven years ago that nearly claimed his life. He gradually got hooked on painkillers, and combined with alcohol, the deadly mixture got him fired from WWE four years ago and also cost him his family. But WWE owner Vince McMahon got him help, funded his rehab and brought him back a seemingly new and better man who was poised to live out the balance of his life clean and sober. The pain, however, never stopped. And apparently without painkillers, the pain from the constant bumps grew worse. So when I got a call later that morning that Eddie had been found dead in a motel room just hours earlier, I was stunned but not shocked. And as devastating a blow as Eddie’s death was to the entire roster who loved and respected him, I don’t think his passing came out of left field to them either. Eddie’s passing has shed light on a serious situation the wrestling business faces today. Wrestlers self-medicate to deal with the pain. Death has become an all-too-frequent occurrence. The industry, specifically World Wrestling Entertainment since it is by far the largest and most profitable wrestling organization in the world, is in dire need of safeguards and reforms, and must take steps in order to prevent performers like Eddie Guerrero from dying on their watch. There are no easy answers, but there are moves that can – and must – be made to clean up the business. Wrestlers should be given extended time off each year in order to recharge their batteries and reconnect with their families. Mandatory routine physicals should be instituted with full-time physicians on staff. Medical insurance should be offered to wrestlers who put their bodies on the line every time they step into the ring. McMahon already has taken a first major step in combatting the problem. Last week he announced a new drug policy that includes performance-enhancing drugs, recreational drugs as well as abuse of prescription drugs. In addition, the company is going to mandate more comprehensive cardiovascular examinations for its athletes. All performers under full-time contract will be subject to frequent, unannounced and random testing. There are many others besides Eddie Guerrero who have dealt with or are currently dealing with issues in a less-than-conducive atmosphere for personal healing. Less than a week after Eddie’s death, Nick “Eugene” Dinsmore was rushed to a hospital during WWE’s European tour after he was found passed out in a hotel lobby. After regaining consciousness, Dinsmore admitted to taking somas, a popular prescription pill among wrestlers that is often abused, and other prescription medication. As a result of the incident, he was sent home from the tour and suspended indefinitely. He currently is being evaluated at a drug rehabilitation facility. It’s imperative that the company continues to make changes to prevent future tragedies and to ensure the long-term health of the industry. I’ve listened to many of his fans over the past two weeks express sadness that one of their favorite wrestlers would no longer grace their TV screens. Eddie was more than just a wrestler. He was an international superstar who was a role model to a growing Hispanic audience. Winning the world title last year was the pinnacle of his career, but it proved to be a very stressful and trying time for Eddie as well. He blamed himself for the poor ratings and house show business that plagued the company during his title reign. Some argued that he was too small to carry the world title, but his outstanding mat work, ring psychology and interview abilities were unquestioned even though his body was breaking down. Eddie knew what his limitations were and fought hard to overcome them. Edouardo Gory Guerrero wasn’t a saint, and he’d be the first to tell you so. His life literally was an open book. A DVD and UPN special last year, “Cheating Death, Stealing Life,” was the basis for a book on Eddie’s life that had been scheduled to be released next month. He was a recovering alcoholic who battled his demons each and every day of his life. He admittedly had a fiery temper that he fought hard to quell. But unlike many who talk the talk but don’t walk the walk, Eddie was a humble, caring family man with a compassionate heart. He counseled a number of the younger workers on the WWE roster, often with a Bible in his hand and a wealth of real-life experience to draw from. He lived out his faith in front of his fellow performers. WWE champion Batista spoke recently about how Eddie would quote him Scripture when he felt discouraged. Shawn Michaels talked not about their wrestling connection, but rather how they shared and encouraged each other in their faith. Chris Jericho called him the most humble man he had ever known and a true warrior for God. While other wrestlers would share off-color road stories in the locker room, Eddie would pull out his Bible and go into the zone. He was the voice of reason other wrestlers turned to when their own lives went spiraling out of control. I have no doubt that Eddie believed every word. I re-read an interview I had done with Eddie (who used the spelling of Eddy outside the ring) not long after his favorite tag-team partner, Art Barr (formerly Beatlejuice and later The Juicer), died suddenly at the age of 28. Barr, one of pro wrestling’s fastest-rising stars at the time, was struck down in the prime of his career and the prime of his life on Nov. 23, 1994. The second-generation wrestler lived hard and fast, but he died peacefully in his sleep as he held his 5-year-old son during a visit home over a Thanksgiving holiday. Although his death initially was attributed to heart failure, it was later revealed that he had a mixture of alcohol and drugs in his bloodstream. What made it easier for Eddie was knowing that he might have had an impact on his friend’s life. He admitted, though, that there were aspects that he wished he could have changed. Eddie also was convinced that there was a greater purpose for their association. There may, however, be an even greater purpose for the man affectionately known as “Latino Heat.” If his untimely death serves as a wake-up call to effect a change in how the wrestling industry goes about its business, then perhaps this fallen hero will be remembered for more than his classic smile and contagious laugh, his ability to capture the hearts and imaginations of wrestling fans, and even his inspirational battle against addiction.